If you have ever owned a wireless charger, or thought about owning one, you might notice that the charger always comes in two parts: a transmitting component and a receiving component (often embedded in the device itself). This receiving component, also known as a receiver module is composed of both a receiver and a rectifier that catches the energy sent from the transmitter in order to charge the device. The receiver module can come in various shapes and forms depending on the technology being used to generate wireless charging. Lets have a look at some of the different types of wireless charging receivers! 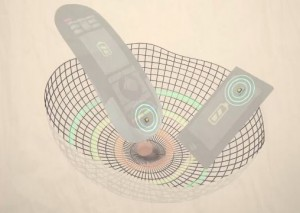 Radio frequency wireless charging can absorb energy with a small pickup element and electric components (circuitry), allowing for especially small form factor of the receiving units. So small, in fact, that Humavox’s RF wireless charging receiver, Thunderlink is the smallest wireless charging receiver available! Thunderlink can be easily integrated into the smallest of electronic devices (such as earbuds or a hearing aid) and combines electronic circuitry and a proprietary RF pickup element in order to enable efficient reception of the RF signal resonated by the NEST transmitter. This works well for small devices such as wearables or hearing aids because it is able to fit the smallest of electronic devices, without the need for industrial redesign. Humavox’s Thunderlink is perfect for small wearable devices such as hearing aids and wireless headphones or earbuds! Inductive wireless charging receiver modules are composed of an electronic circuit as well but also use a large coil that acts as the pickup element for the reception of the energy transmitted by the charging station/induction pad. The magnetic field is generated by the transmitter coil and then converted into an electrical current by the receiver to charge your electronics. The coils are fairly large and have physical limitations as to how much they can minimize, thus this type of receiver works well for larger devices (such as a smartphone or electric toothbrush). In general, larger flatter surfaced devices are the best candidate for induction, with their ability to fit the larger induction coil that is required to receive the energy to create the charge. At Humavox, we have created a new and exciting way for RF wireless charging that lets users simply drop their wearable into a charging station. Humavox’s Thunderlink is small and flexible enough to fit into the smallest of electronic devices, without the need for coils. Soon we will charge without even noticing!